Practical courses in Ethology: Education with commitment! Since 2000 practical courses in ethology are an integrated part of our project M.E.E.R. La Gomera. Participants are introduced to observing wild cetaceans and they will be educated with the theory and practice of ecological whale watching as well as all stages of modern ethology – from data collection to working with a data base. These courses are part of our long-term research on La Gomera and they also fulfill the “educational mandate”, which represents one of our association’s goals. Since the first course in autumn 2000 we have conducted more than 25 courses with great success. Up to 9 motivated students or others interested in dolphin- and whale research took part in our research efforts to investigate the interactions between cetaceans and boats. The courses give a profound introduction to methods in studying animal behaviour. All stages of ethology are covered: observing animals, using different types of equipment to collect data, storing and analysing data sets, interpreting observations, etc. The research of the non-profit association M.E.E.R. is conducted from small whhale watching boats. During their two-weeks stay, participants take part in 7 excursions. 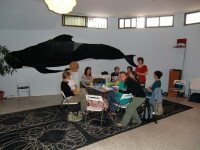 Several working meetings, alternating with the excursions, put accross the methodological and technical tools of ethology. The good balance between theory (on land) and practice (at sea) always is highly appreciated by the participants, which is confirmed regularly through our surveys at the end of each course. 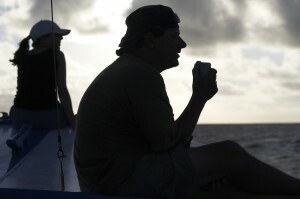 Moreover, the course offers a broad spectrum of background information about whale watching and marine conservation issues. 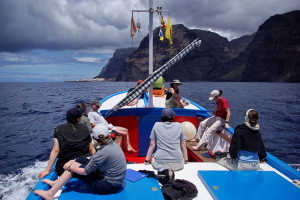 The study area southwest to the island of La Gomera is home fora great variety of different cetacean species. In the centre of our interest lie the interactions of marine mammals with the whale watching boats – which due to the high species diversity are studied comparatively. 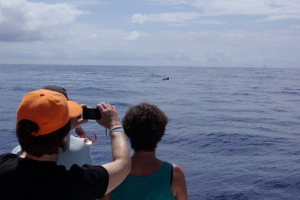 The investigations also are part of aholistic concept combining whale watching tourism with scientific research and public education, thereby contributing to marine conservation. Everybody with an interest in cetacean research can take part! These courses are fully accepted for the study of biology at Humboldt University Berlin (Germany), and the University of Vienna (Austria). The same may apply at your own university or college! We will support you when you plan to make an according proposal to your faculty. In any way, all participants will receive a certificate of attendance.